Having gone through two internal hard drives and risking running it from a Firewire drive for far too long now, it was time to replace my good old iBook G4 with something a bit more 2007. 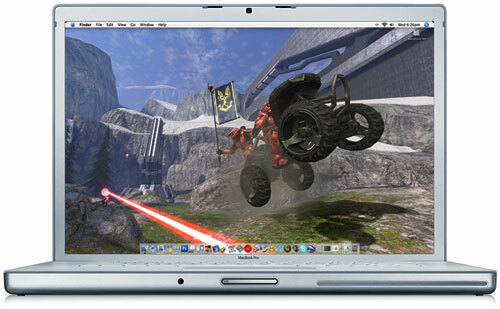 Like something that is clocked in multiple GHz and can run both Mac OS X and lesser operating systems for the sake of convenience Battlefield 2. Ended up costing me £1,150 after student discount. I bought it with the stock 1GB RAM and added another 1GB stick myself (£40 from Crucial compared to £140 from Apple, which is in the dictionary next to ‘no brainer’) and it’s awesome. It obviously performs much better than my iBook and I’ve been playing with some Intel-only apps and stuff that’s been added to OS X since I last bought a new Mac like Front Row and the Joost beta to which I got an invite last week. The iBook couldn’t play 720p video smoothly but I downloaded a couple of 1080p trailers and this plays them without a hitch. Lovely! The only annoyance was that it doesn’t ship with all the latest updates, so I had to download a stack of patches before I could really get down to playing. That included 10.4.9 which came out well over a month ago, so I wonder how long this was sitting in a warehouse. But if that sounds bad when I installed XP Pro I had to download SP2 (200MB+) and 55 (!) security updates. It was the ability to boot into Windows that had me quite intrigued, mainly because my three years of almost exclusive Mac use meant three years with only fleeting games of Battlefield 2 and Counter-Strike. Getting XP Pro installed took a couple of attempts because I only have a copy with Service Pack 1 installed, so I had to use AutoStreamer to make a copy with SP2 integrated to that I could install the necessary Mac drivers. That done, though, it works brilliantly, and coupled with Parallels so that I can visualise Windows while using OS X (I’m using it as I type this to download my Steam games) I get to have the best of both worlds. No more relying on occasional Mac ports or the computing anachronism in the other room to use most of the PSP hack applications, and some CS action is but a reboot away. Hopefully my computing needs will be set for the next few years now. Just out of interest, why didn’t you wait for Leopard (10.5) good sir? I’m going to buy my Macbook soon too (my first Mac), but I’m just gonna hang on till it’s release. To be honest I don’t yet see a great reason to jump on the Leopard bus as soon as it arrives, although I probably will. In any case I should only end up paying about £60 for it which is reasonable IMO. Just think of how much you’d pay for Vista. Time Machine looks cool but I do weekly backups with SuperDuper anyway. Booleans for Spotlight is nice as well, but I don’t see anything that’s as much of a great addition as Spotlight itself was for Tiger. Not worth waiting until October (?) with only an iBook with a dead hard drive (it’s been running on a FireWire drive for months), in other words. There’s not a lot to it really. Buying a USB or Bluetooth two-button mouse helps the transition because Apple is stubbornly sticking to one button on everything. The one is workable and you don’t need any more than that for most apps, but it’s less hassle to not have to remember to hold control. Installing applications is another thing that I see Windows users struggling to get their head around. Apps usually come in a disk image (.dmg) file which you double click to mount as a virtual drive. You then drag the app into your application folder and can unmount and delete the image. I see so many people with their application folder littered with disk images or mounting them up every time they want to use the application. Also install VLC and set it as your default media player for any videos that aren’t MP4 or MOV. It’ll play any codec you throw at it and saves hunting for Quicktime compatible versions of XviD and stuff. This has some decent tips as well. Luckily the new Macs have the safety net of being able to boot into Windows which is extremely appealing for most potential switchers.